March has been a great month so far! Floral Sunshine has a new weekly client – one of the newest coffee shops in the St Johns neighborhood. It’s called Fourth Estate Coffeehouse and it’s a cute little place with excellent coffee (from Stumptown Coffee Roasters) and yummy food. Each month, they feature a different artist. For the month of March, the art that is featured on the walls is by a regular customer, Jim Ollett. We love art of all types and are excited that our floral art will hang out on the counter at Fourth Estate too! Are you a piece of work? Maybe you will hang out there too! 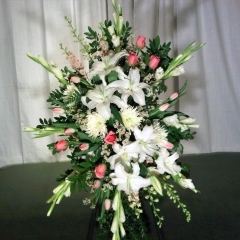 Getting weekly flowers for your business is a great way to create a welcoming and warm environment. If you’re interested in getting floral or plant services for your business on a weekly, bi-weekly, or monthly basis. Please don’t hesitate to give us a call or send us a note from our contact form. We deliver weekly all over the Portland metro area and have a lot of experience working with hotels, restaurants, office buildings, law firms, wineries, waiting rooms / lobby areas, etc…. and we would love to create a customized plan that works for you. Valentine’s Day is a month away! Well…. I bet you’re either looking forward to Valentine’s Day this year, or you’re dreading it! There seems to be no in-between. Most florists have a love/hate relationship with Valentine’s Day. No matter how much experience we have or # of years we have been in business, Valentine’s Day can be an unpredictable holiday. 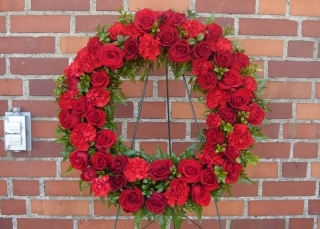 To give you a little more insight, in our industry, florists must pre-order flowers for this BIG holiday over a month before Valentine’s Day. (If we don’t pre-order, we may not be able to get what we need for our customers.) Then we pray, wish and hope that we have guesstimated the right amount of each type of flower we purchased. Sigh… Also another thing we have to deal with is supply and demand and the increased cost of flowers. 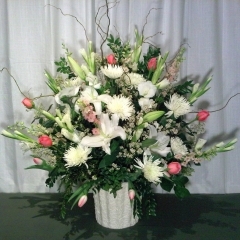 Supply and demand for flowers on Valentine’s Day (and Mother’s Day) go through the roof! The cost of flowers increase significantly and sometimes up to twice the normal going rate. So… for those of you that think that florists are evil and just jack up prices on Valentine’s Day… think again. 🙁 We don’t do it because we see this amazing money making opportunity. We do it because our growers/supplies do it because of the supply and demand. Enough negativity, buy your sweetheart, mother, friend, or buddy some flowers for Valentine’s Day… it’s the one holiday that you should definitely go all out to remind them that they are loved. Oh, and don’t get it at the grocery store where all the bunches are picked over – get them from your local florist who will give you quality, long-lasting flowers, beautifully arranged in a vase. Floral Sunshine is excited to announce that we now have an Indian wedding mandap for rent. This is not a flimsy mandap, this is a very strong & sturdy white wooden mandap. We set-up and decorate the mandap with coordinating fabric and flowers. Please contact us for a consultation! 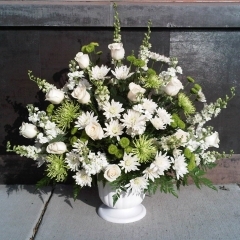 annie@floralsunshine.com or (503) 974-4740. Check out our monster cooler! The monster floral cooler has come out of storage and is being moved into the new studio!! This thing is 11 ft long, and it was quite a challenge to get it into our suite! Floral Sunshine showcased at the 2013 Portland Indian Wedding Show earlier this month, check out this blog post! Happy Valentine’s Day! In 2 days! Happy Valentine’s Day Everyone! If you haven’t already placed your order, do it as soon as possible so we can ensure timely delivery. 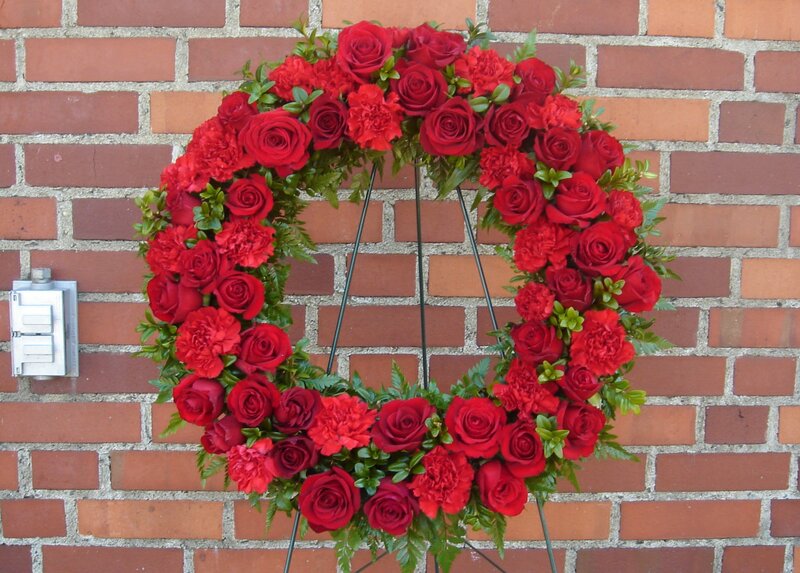 Here are your options for Valentine’s Day Roses & Flowers! Floral Sunshine had the pleasure of working with a very lovely couple, Mandy & David this past July. They got married at the Bigfoot Lodge (address to remain a hidden secret) as the lodge doesn’t publish their address because they are by appointment only for showings and events. You won’t find too much info about the Bigfoot Lodge online or elsewhere really, but believe me, it is a very beautiful and quaint venue. Our favorite part of creating flowers for Mandy & David – was that they trusted us and allowed us to make designer’s choice flowers according to their color scheme. 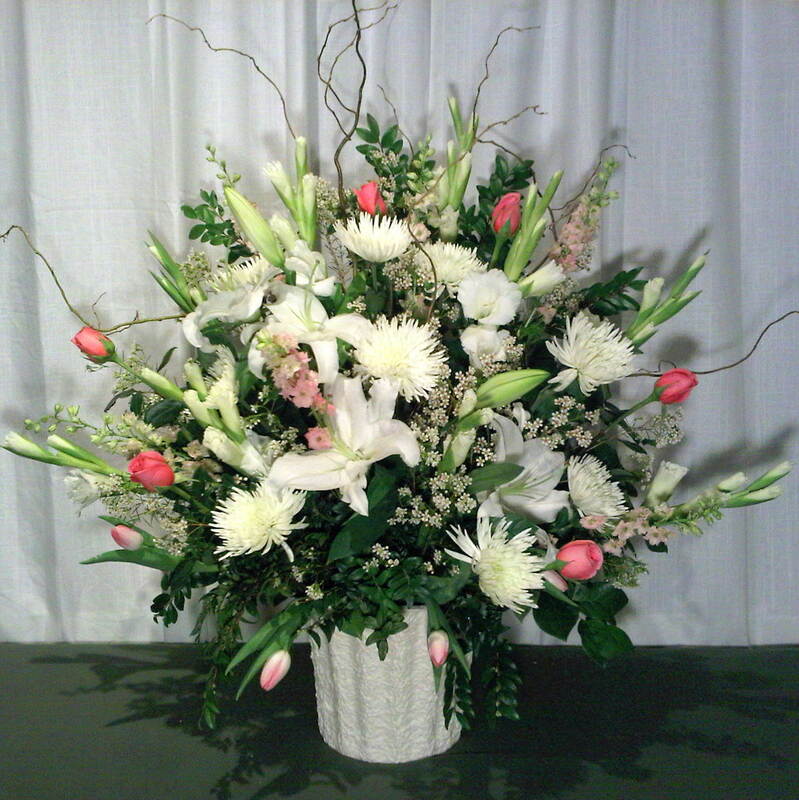 Some of the flowers included were local purple dahlias, green spider mums, drumstick allium, green ball trix, green roses, kermit poms, and mini green hydrangeas. We also emjoyed the challenge of making custom floral centerpieces inside/atop wooden cabins! Bridal Bouquet Featured on Wedding Chicks! 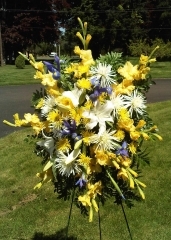 One of Floral Sunshine’s bridal bouquets was featured on Wedding Chicks on May 18th, 2012. You can see the posting here. This bouquet was fun to create! It is comprised of purple dendrobium orchids, lavender hyacinths, blue anemones, gray berzelia berries, black feather plumes, and a touch of purple wax flower. 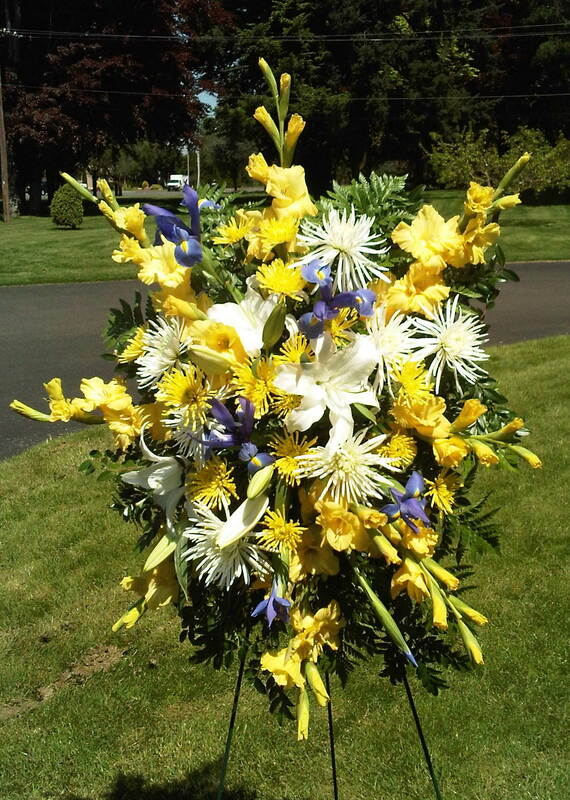 Please note that these are just a small sampling of Floral Sunshine’s memorial arrangements, we take customized orders all the time, so please call to discuss and we can let you know the cost and availability.